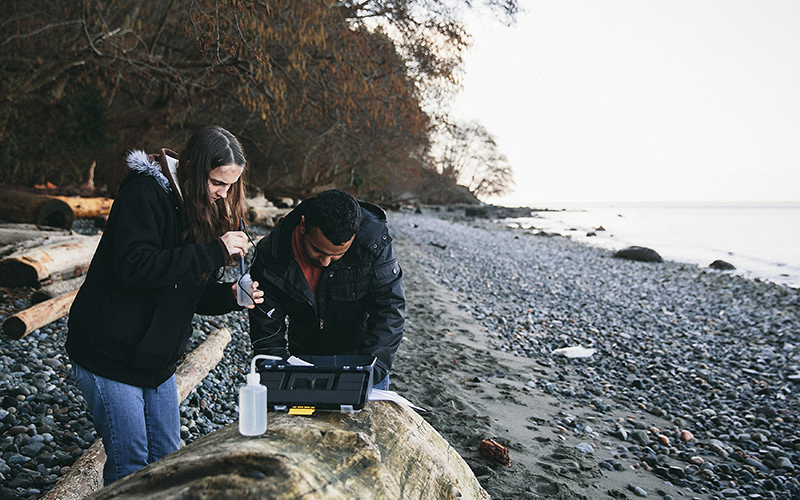 UBC proudly embraces interdisciplinary exploration and innovative programming, and promotes teaching methods that help you become a critical, independent thinker. As of today, UBC has more integrated first-year programs than any other Canadian university. Here are just a few examples of your opportunities for interdisciplinary and innovative study. Philosophy, psychology, linguistics, and computer science come together in the study of cognitive systems. Explore the differences between natural and artificial intelligence and examine how they work together through human-computer interfaces. Learn how to use computer science and statistics to quantify information and make informed, evidence-based decisions. As a Data Science graduate, you can work as a business or data analyst, a data architect, or a statistician. Investigate issues and questions related to the growing human population, the sustainability of resource use, degradation caused by pollution and disturbance, and the endangerment and extinction of species and natural systems. Gain an in-depth understanding of the major environmental issues facing human societies with a cross-disciplinary curriculum that incorporates elements of chemistry, earth and ocean sciences, life sciences, and social sciences. Complete your first year in Arts, Land and Food Systems, or Science, before developing a richly layered understanding of complex international resource issues through courses in arts, sciences, and social sciences in the Global Resource Systems program. Study political science, history, sociology, and anthropology to better understand the challenges of the 21st century. Explore the dynamics of globalization and examine international politics while drawing on diverse disciplines to make sense of our complex world. Prepare for a professional career in media by exploring eight arts disciplines and computer science through theory, research, and application. Play an active role in protecting and managing our natural environment through your analysis of urban development, agricultural practices, mineral and oil extraction, and fishery and forestry practices. Learn how to analyze the rules that govern us, examine decision-making in an increasingly globalized marketplace, and develop informed opinions about the world we live in. Work with other urban planning, infrastructure development, and management professionals to develop attractive, sustainable, and effective shelters. Learn how to manage urban green spaces and ecosystems so our world can stay a little bit greener. Pursue a subject you’re passionate about and concurrently earn a postgraduate degree from the UBC Sauder School of Business, one of the world’s most prestigious business schools. Simultaneously earn Bachelor of Arts and Bachelor of Science degrees while immersing yourself in each faculty, taking a variety of subjects, and actively participating in the Arts and Science student bodies. Study in Canada and France and earn degrees from UBC and France’s Sciences Po, a research-intensive university specializing in social sciences and humanities. Learn from a multidisciplinary team of instructors in a small and supportive cohort. Arts One is a writing-intensive program with a humanities focus in one of two streams: Authority and Resistance; or Dangerous Questions, Forbidden Knowledge. Learn from a multidisciplinary team of instructors in a small and supportive cohort. In the Coordinated Arts Program, you’ll explore subjects in one of five streams: Media Studies; Global Citizens; Individual and Society; Law and Society; and Philosophy, Political Science, and Economics. Explore scientific questions with a small group of like-minded students using concepts from biology, chemistry, physics, and math. Science One focuses on research and independent work, with a four-day field trip to the Bamfield Marine Sciences Centre. Explore scientific questions with a small group of like-minded students using concepts from biology, chemistry, physics, and math. The Coordinated Science Program offers supportive group learning and hands-on activities in weekly workshops. Get hands-on experience in small classes for your core courses through this integrated program for Forestry and Land and Food Systems students. Lands One gives you the opportunity to develop valuable relationships with instructors and peers, while diving into content that is directly connected to current land issues. Earn first-year degree credits while you develop your academic English in a cohort-based, 11-month program that prepares you for a smooth transition to second year. Design your own cross-disciplinary course of study in consultation with an advisor on the Okanagan campus. Choose courses from the humanities, sciences, social sciences, and creative and performing arts. Design your own cross-disciplinary course of study in consultation with an advisor on the Vancouver campus. Choose courses from the humanities, sciences, social sciences, and creative and performing arts. Receive extensive and careful advice on your curriculum choices and overall educational objectives while you design your own degree. Brace yourself for a highly interactive science program that values active learning, group discussion, and collaborative research. As an Integrated Sciences student, you also get first priority for a three-week-long field course in Iceland on science, systems, and sustainability. Which UBC Forestry program is right for you?